If you visit Nicholas Hawksmoor’s Christ Church, Spitalfields on any given Tuesday, you will find Stanley Rondeau – where he works unpaid one day each week, welcoming visitors and handing out guides to the building. The architecture is of such magnificence, arresting your attention, that you might not even notice this quietly spoken white-haired gentleman sitting behind a small table just to the right of the entrance, who comes here weekly on the train from Enfield. But if you are interested in local history, then Stanley is one of the most remarkable people you could hope to meet, because his great-great-great-great-great-great-grandfather Jean Rondeau was a Huguenot immigrant who came to Spitalfields in 1685. Jean Rondeau was a serge weaver born in 1666 in Paris into a family that had been involved in weaving for three generations. Escaping persecution for his Protestant faith, he came to London and settled in Brick Lane, fathering twelve children. Jean had such success as weaver in London that in 1723 he built a fine house, number four Wilkes St, in the style that remains familiar to this day in Spitalfields. It is a measure of Jean’s integration into British society that his name is to be discovered on a document of 1728 ensuring the building of Christ Church, alongside that of Edward Peck who laid the foundation stone. Peck is commemorated today by the elaborate marble monument next to the altar, where I took Stanley’s portrait which you can see above. 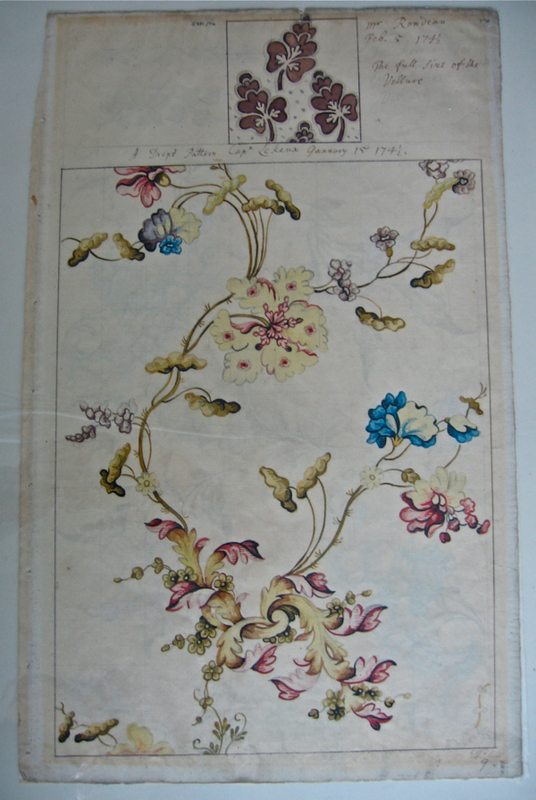 Jean’s son John Rondeau was a master silk weaver and in 1741 he commissioned textile designs from Anna Maria Garthwaite, the famous designer of Spitalfields silks, who lived at the corner of Princelet St adjoining Wilkes St. As a measure of John’s status, in 1745 he sent forty-seven of his employees to join the fight against Bonnie Prince Charlie. Appointed Sexton of the church in 1761 until his death in 1790, when he was buried in the crypt in a lead coffin labelled “John Rondeau, Sexton of this Parish,” his remains were exhumed at the end of twentieth century and transported to the Natural History Museum for study. “Once I found that the crypt was cleared, I made an appointment at the Natural History Museum, where Dr Molleson showed his bones to me.” admitted Stanley, widening his eyes in wonder. “She told me he was eighty-five, a big fellow – a bit on the chubby side, yet with no curvature of the spine, which meant he stood upright. It was strange to be able to hold his bones, because I know so much about his history.”, Stanley told me in a whisper of amazement, as we sat together, alone in the vast empty church that would have been equally familiar to John the Sexton. In 1936, a carpenter removing a window sill from an old warehouse in Cutler St that was being refurbished was surprised when a scrap of paper fell out. When unfolded, this long strip was revealed to be a ballad in support of the weavers, demanding an Act of Parliament to prevent the cheap imports that were destroying their industry. It was written by James Rondeau, the grandson of John the Sexton who was recorded in directories as doing business in Cutler St between 1809 and 1816. Bringing us two generations closer to the present day, James Rondeau author of the ballad was Stanley’s great-great-great-grandfather. It was three generations later, in 1882, that Stanley’s grandfather left Sclater St and the East End for good, moving to Edmonton when the railway opened. And subsequently Stanley grew up without any knowledge of Huguenots or the Spitalfields connection, until that chance meeting in 1980 leading to the discovery that he is an eighth generation British Huguenot. There is no such thing as an old family, just those whose histories are recorded. We all have ancestors – although few of us know who they were, or have undertaken the years of research Stanley Rondeau has done, bringing him into such vivid relationship with his ancestors. I think it has granted him an enviably broad sense of perspective, seeing himself against a wider timescale than his own life. History has become personal for Stanley Rondeau in Spitalfields. 4 Wilkes St built by Jean Rondeau in 1723. Pictured here seen from Puma Court in the nineteen twenties, it was destroyed by a bomb in World War II and is today the site of Suskin’s Textiles. The copy of James Rondeau’s song discovered under a window sill in Cutler St in 1936. Stanley Rondeau standing in the churchyard near his home in Enfield, at the foot of the grave of John the Sexton’s son and grandson (the author of the song) both called James Rondeau, and who coincidentally also settled in Enfield. Until you start to do family history for yourself you will never know the wonder and joy it brings. Some people may say they’re not bothered about it all but i defy anyone not to be moved by some of the stories that you can uncover by following this fascinating pastime/hobby/compulsion ! I found this post really interesting all the more so because of Stanley’s direct connection to the past and the fact that he has chosen to be a part of his family’s continuing story. Wonderful story, from chance meeting with a vicar to the chance find of a century old ballad. The serendipity of our lives never ceases to amaze me. There’s a kind of legend that my family had Huguenot links. I’ve never managed to confirm that, although my father claimed his mother had obtained a grant from the Hugenot Society for my fathers’ older brother. It could have been some kind of educational grant, but very early in my researches, many years ago, I proved it to be untrue. Just another family legend? Probably, but very recently I’ve come across a number of families with the name ‘le Dent’ living in and around the town of Guines in northern France at the tine of the revocation of the Edict of Nantes. Shortly afterward they star turning up in the marriage registers of ‘the Huguenot church in Spitalfields. There’s a Dutch researcher who has found these and many other similar families. I’ve absolutely no proof that I have any connection to any of them, but the whole thing is very tantalising. I wonder on which days of the week Mr Rondeau visits Christ Church? I’d love to meet him. I forgot to add to my original message that all my Dent family that I have found so far were silk weavers in Spitalfields and neighbouring areas during the first half of the 19th century. This story was wonderful. I have done genealogical work on my family, but, oh, that I could have such a rich story to tell ! This was delightful and so rich. Thanks for researching this and writing such a clear and full story. The photos are wonderful. Have just realised I am related to you Stanley! I am a decendent from Jean Rondeau 1666, down through John Rondeau 1706, John Rondeau 1754, Thomas Rondeau 1794, Thomas Rondeau 1819, Thomas Rondeau 1845, Thomas Rondeau 1869, Leonard Rondeau 1901, Elsie Moys Nee Rondeau 1931, Chrisitine Harris Nee Moys 1960, then me Jayne Harris 1988! Are you related to Ellen Rondeau 1885-1960? We’re doing some geneology research and this is our relative. Would be great to hear from you to see if our family trees link up. I was the person who spoke to you on Tuesday last about my Huguenot ancestry, and we found that your ancestor John, the sextant, most probably buried my ancestor Ann Lemaire! It was most interesting talking to you and I will call again sometime soon. Ellen Rondeau (1885-1960) was my great grandmother! How are we related? If you can, would you give me email address to Claire so she can contact me directly regarding Ellen Rondeau, please? Hope you come back to read this, I’m intrigued to know how we’re related! Sarah here again . I hope you are keeping well.I have a query with regard to my ancestor Benjamin Hooper who married Elizabeth Rondeau. I am unable to find any record of Benjamins parentage. We know he married Elizabeth in 1764 at Christchurch Spitalfields. I have had a copy of his will translated and he leaves all his estate to his son George. However the estate is called Barton Hill Farm and lands and possibly a poperty called Tilleys Court and is in Brstol (Gloucester in the 1700′s). I am intruiged to know how Benjamin came to own property in Bristol (Could it have been to do with the weaving and the port of Bristol or is it that the family are related to Bishop John Hooper who was from a wealthy Somerset family. Would there be any records at Spitalfield of his parentage since he was Baptised there as I need some names dates and locations to continue my search to make the links. How interesting. My husbands ancestors were silk weavers and loom brokers at number 15 Sclater St and Bacon St . Possible neighbours of your ancestors .William Saunders was father of Robert Vincent Saunders who married Martha Duce. We’ve always wondered if the Duces ,also weavers ,were Huegenots. Also Vincent seems to have some meaning, which we haven’t found yet, as there are Robert Vincent Saunders coming down the line to now. Nice to keep the silk weavers history alive. My family and I had the honor of meeting Mr. Stanley Rondeau during a vaction to the UK last month. As a Huguenot descendant I found his personal reflections on both his family and the French Protestant Refugees at Christ Church in Spitafields to be one of the highlights of our trip. I have like yourself, just recently discoverd that my pre- decessors were of Huguenot decent. They settled in London in the 15 hundreds, although the family name can be traced back in England to 1298. From 1675 they can be traced in St Boltoph’s Church Algate, then to Canterbury Kent where Henry Grew a silk Weaver jouneyman met his then to be wife Elizabeth Bentot. Both these names appear in the marriage records of Christ Church Spitalfields. My great great great great grandfather Obadiah Grew was therir son who was baptised in Whites Row Huguenot Chapel in 1735, record kept in Christ Church. many of his kinsmen and forebears were also chritened and buried at this church and later at St Mathews Bethnal Green some were married and christened at the Huguenot Chrrch theadneedle Street. I would very much like to meet you as regards our common ancestry. Interested to read a prior comment about Duces also being possible Heguenot silk weavers. I have been trying to research this possibility after being told this years ago by my grandfather. No luck yet on any firm evidence, but I do know there was a large Huguenot or Walloon population in Camb/Suffolk, where my ancestors seem to hale from. I met Stanley at a Huguenot Society meeting recently, he is such an interesting person as you can well imagine by the above fascinating story and his enthusiasm gave me the incentive to put more energy in tracing my ancestors further back to what I have searched so far, so a big thank you Stanley. sarah catterall. I have more information on the hooper/rondeau family I have been researching this family for many years. Thomas hooper was not at the Battle of Trafalgar, I know exactly where he was. I have not found any links with descendants from Somerset. Benjamin Hooper was a bit of a “Spiv” or Chancer” of his day. I have the baptism of benjamin hooper & his siblings,marriage of his parents,grandparents,gt grandparents. researched back to the 1600′s.definitely no link to the bishop of somerset. benjamin hooper seemed to have nasty characteristics, as his son thomas. probably scuttled his family to bristol, scandal on the horizon. benjamins mother-in-law had a re4lative who had connections with bristol. forget the inheritance, sorted that out by researching very old records at the old chancery lane, which has now closed. jacob crook did not receive much money in hand,but did have barton house. have all the research on thomas hooper from midshipman to his injury, retired on half-pay until he died. all has been confirmed by Greenwich. nasty man. margaret gilvier & sons did not have the money to contest will. this confirmed at the national archives. you have got a lot wrong, think of all the suberbs in the east of the country. Hello Hazel , you certainly seem to have a lot of knowledge regarding the Hooper family . Can you clarify how you are related to the Hoopers and if so where have you sourced the majority of your information ??. We have been struggling with Benjamins ancestors and so would be very interested to see the information. Please could you email me, as I would be interested in any information you have relating to Thomas and Benajamin Hooper and their ancestors. I live in the Bristol area and I’m very interested in this side of the family. sarah. I will write an article, possibly three all told as they will be quite long. I have a copy of Thomas Hoopers marriage certificate, and I know exactly where he was in 1805. So I had better start with him, Trafalgar was a fairy tale. All the research about the “Inheritance” was at the Old Chancery Lane , which held the tax records for England & wales, this closed about a year later, so I was just in time. New Greetings from Tucson, Arizona, cousin. I was so happy to see this. I had pictures from our Canadian cousin, and was so happy to know the family name continues. I am in direct line from Rev. William Rondeau, “The Backwoods Preacher”, who had an epiphany, left his job as Queens Solicitor, and brought his family in the early 1800s to western Kentucky. I sent you a big hug (), and am so glad to know you. How do I contact Jayne Harris, Claire, Lesley, and Sarah Catterall? I have cousins I never knew about. Can you give me their email addresses so I can share where the American cousins went?I keep in regular contact with Ron Baker, our Canadian cousin, a direct line also. His family is very interested in genealgy/heritage. Mary from Tucson, Arizona and Michigan. I was so very surprised and pleased to hear your family immigrant story on National Public Radio (NPR) tonight while I was traveling home. I have so wanted to know more about the Rondeau geneology. I have not known any other Rondeaux other than the ones in my closest family who seemed to have come through Canada and settled in the northern states of the USA. There is one Noah Rondeau, supposedly a distant cousin, who is a famous hermit (sounds like an oxymoron to be both famous and a hermit). He lived in the Adironacks of New York State. He appears in New York state history books. I believe we may be descendants of three brothers who came to Canada from France. They were physicians. My Rondeau family is Catholic but I became protestant in my adolescence. I hope my daughter and I get to meet you, Stanley. So very interesting all of it! Can anybody tell me if there is a record of when and which weaver families left Spitalfields/Shoreditch to work in the industry in East Anglia, My weaver ancestor lived and worked in the Waveney Valley on the Suffolk Norfolk border. I have not found a record of his parents but know he was born about 1768. There are likely parents for him in the Spitalfields area but I am struggling to make the connection. Thanks for all these stories and this wonderful website. Hello Stanley: I was so excited to find this information on the Rondeau family. James Rondeau 1756 was a Great Uncle through Susannah Rondeau and Andrew Larcher. Andrew’s father, Andrew, was my 4th Great Grandfather. I was also excited to see that you live in Edmonton. I grew up in Edmonton and my sisters still live there. My father worked for the CNR. I would love to connect with you. I also have other Huguenot relations surnames ‘Dormer’, which I am having trouble tracing back to France. Thank you for all your work on the Rondeau family. Our relatives were so amazing. I am doing my family history Marie Suzanne Petite married Joseph Grout and I would love to go further back- but don’t know how to do this I will try to go to the Christ Church next Tuesday . from Kathy. My father and I are also direct descendents to Jean Rondeau we have gone back one generation more to Jeans father Issac Rondeau. My Auntie who sadly passed away a couple of years ago spent 25 years researching our family tree. I think we will need to take a trip to Christ Church! Also descendants of the Rondeau’s here. My 5x great grandfather Willliam Charles Baker, married Pehebe Rondeau, daughter of James Rondeau, author of the ballad. Thanks so much for bvinging this story to light! The first Jean Rondeau (b 1666) was my 6x great grandfather; his great grand daughter Phoebe Rondeau Baker was my 3x great grandmother. I’m so glad that I stumbled on to this site; it has given much insight as to the history of my family. I look forward to making it to England one day and walking the same streets my ancestors walked. I’m so glad to have found this site. I recently found out that I’m descended from Jean Rondeau whose grandson John Rondeau (1754 to 1802), married Sarah Slyatt and their daughter Sarah Rondeau married John Poyton. I moved to France and married a Frenchman and my two sons were born and still live there, so our family has come full circle! This is such an interesting site. I am also of Huguenot descent. in fact I believe I am related to the gentleman Daniel Grew who has written on this page earlier. One of my ancestors also lived on Wilkes street. I really hope to come and visit the church in the coming weeks and I do hope that you will be there as I would love to meet you. My daughter and I visited Christchurch in Spitalfields yesterday 1st April 2019 to see if there were records of our ancestors. My grandmother was called Edith Marmoy and her ancestors were Marmoys and Rondeaus as they intermarried when John Marmoy (previously Marmois) married Elizabeth Rondeau. They were Huguenots and came from France to Spitalfields. Jean Rondeau the Sexton was the nephew of Elizabeth Marmoy so a distant cousin of mine. We share all the people mentioned in your book as ancestors in our family tree. Are you always in the church on Tuesdays as I would very much like to meet you? I now live in Yorkshire but visit London occasionally. Or perhaps we could speak on the phone? Do let me know how I can contact you, we bought your pamphlet yesterday and I would like to learn more. Sorry I need to correct the post above, having checked my family tree I can see it was Job Jacob Marmois married Elizabeth Rondeau in 1678 in Paris before they came to Spitalfields in 1681. Job Jacob Marmois and Elizabeth Rondeauis are direct ancestors of mine. That is the point the two families connected in my tree. Hi Mary Moulder, we are related. William Rondeau and Glennis Ann Wainwright are 3rd cousins 5 times removed. Their common ancestors are Isaac Rondeau and Jeanne Barquet. I live in Arizona now also.